We all dream of an even, streak free, odour free, perfect golden tan but what lengths would you go to to get it? Lying on a sun lounger and burning, standing in a tanning booth and damaging your skin, or snorting an untested unapproved tanning product up your nose? It may all sound ridiculous when you say it out loud but these are the steps some individuals take in order to obtain bronzed skin. When it comes to being tanned I am just as keen as the next women to look as though I have a ‘healthy glow’ but I prefer to get mine out of a bottle or a can and have decided the scent, hassle and streaks are worth it if it means my skin stays healthy. However, there is one fake tan spray I definitely won’t be trying, and that is a new product known as Ubertan Sunless Tanning System. This spray is one with a difference, as it is actually intended to go up your nose and not on your body. The instructions on the box recommend spraying the product up your nostrils twice a day for 10 to 14 days. Users of the product have already reported side effects such as dizziness and nausea, and the Medicines and Healthcare products Regulatory Agency (MHRA) are concerned that the product lists no ingredients on the box or bottle and are advising consumers against purchasing or using the product. The MHRA believe the product may contain Forskolin, which is not licensed for sale in the UK. Another similar product under investigation by the MHRA is thought to contain Melanotan II, a type of hormone which increases levels of the pigment melanin in the body. Again, Melanotan II is also unlicensed in the UK and illegal to sell. 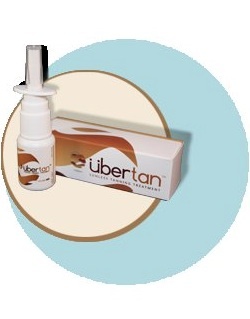 The MHRA have said that Ubertan Sunless Tanning System is not a licensed medicine and therefor it is illegal to sell, advertise or supply it in the UK. Claire Tilstone, from the organisation has said she is worried that users will suffer serious side effects as nether Ubertan or other nasal tanning sprays have undergone testing to prove it is safe or that it works. “At best it’s a waste of money, at worse it can seriously damage your health. “Don’t use this product, throw it away if you have already bought it and don’t buy any more.” She said.